Spartanburg Stainless Products, Inc., headquartered in Spartanburg, South Carolina manufactures high quality stainless steel containers. When product integrity is essential look to container systems from Spartanburg Stainless Products. Use of stainless steel is key because it will not absorb chemicals, allowing the container to be reused without concern of contamination. Valving options for a closed loop system eliminate the possibility of contamination and exposure. And, if needed, a nitrogen or inert gas blanket can be used to improve purity, eliminate condensation and oxygen, all requirements in sanitary applications. All containers are UN/DOT approved for Packing Group I, II, & III products; ASME containers are also available. We can customize any design with specific size and valving options to meet your specific needs. 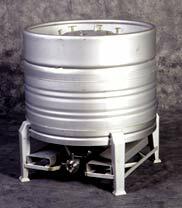 With facilities in Pennsylvania and South Carolina, we can produce containers from 5 liters to 5000 gallons.